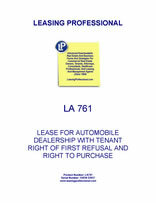 This lease for an auto dealership contains a purchase option in favor of the tenant car dealer, in addition to a right of first refusal in the event the landlord decides to sell the property. 1. LEASE DATA; DEFINITIONS. Whenever used in this Lease, the following terms shall have the meanings indicated below. 1.1 Applicable Laws. Any law, ordinance, code, order, rule or regulation of any Governmental Authority. 1.3 Expiration Date. ______________ subject to extension in accordance with Section 4 hereof. 1.4 Governmental Authority. The United States, the State of ____________, and any political subdivision thereof or any local public or quasi-public authority, agency, department, commission, board, bureau or instrumentality of any of them including, with respect to matters pertaining to insurance, rating bureaus or insurance carriers to the extent they have power to impose conditions on the issuance of policies or the coverage thereof. Tenant: ACCEPTABLE CAR DEALER, INC.
1.6 Premises. That certain real property located in __________________ County, ____________, legally described in Exhibit A hereto, together with all improvements and fixtures thereon. 1.7 Rent. The Rent payable hereunder as set forth in Section 3 and 4 hereof. 1.8 Term. A ten (10) year period commencing on the Commencement Date and expiring on the Expiration Date, subject to Tenant's right to extend the Term for eight (8) additional five (5) year renewal terms in accordance with Section 4 hereof. 2. LEASE OF PREMISES. Landlord hereby leases to Tenant, and Tenant hereby leases from Landlord, the Premises during the Term hereof, upon the terms and conditions contained herein. 3.1 Initial Rent. Tenant shall pay Rent for the Premises in equal monthly installments initially of ______________________ Dollars ($_______) per month, in advance on the first (1st) day of each calendar month included in the Term, as the same may be extended. All Rent shall be paid in lawful money of the United States at the address of Landlord set forth in this Lease or at such other place as Landlord in writing may designate, without notice, offset, demand, or deduction (except as otherwise set forth herein). For any portion of a calendar month included at the beginning or end of the Term, Tenant shall pay the prorata portion of the Rent installment for each day of such portion, payable in advance at the beginning of such portion. All monies to be paid under this Lease by Tenant to Landlord will be Additional Rent, and will be due and payable without offset, demand, or deduction, and Landlord will have the same remedies for Tenant's failure to pay the Additional Rent as for the nonpayment of Rent. 3.2 Rent Adjustment. Commencing on the fifth anniversary of the Commencement Date and thereafter annually on each subsequent anniversary of the Commencement Date during the original ten (10) year Term of this Lease, monthly Rent payable hereunder shall be increased from that payable in the immediately preceding lease year by the lesser of (i) two percent (2%), or (ii) the same percentage as the increase, if any, in the Consumer Price Index "U.S. City Average, All Items, All Urban Consumers, 1982-1984" published by the United States Department of Labor, Bureau of Labor Statistics (the "CPI"), during the immediately preceding lease year, determined by comparing the CPI most recently published on the first day of the immediately preceding lease year and that most recently published at the end of said preceding lease year. In no event shall Rent increase by more than two percent (2%) during any single year. In the event the CPI shall hereafter be converted to a different standard reference base or otherwise revised, the determination of the percentage increase shall be made with the use of such conversion factor, formula, or table for converting such index as may be published by the Bureau of Labor Statistics. If publication of the index is discontinued, the parties hereto shall select another index which best measures inflation in the Denver, ____________ area for purposes of making these calculations. 3.3 Interest. In the event any Rent or Additional Rent is not paid within ten (10) days of when due, the amount so unpaid shall bear interest at the rate of one percent (1%) per month until paid. 4.1 Extension of Term. Tenant shall have the options to renew this Lease and to extend the Term hereof for eight (8) additional, consecutive five (5) year terms. Tenant may exercise the renewal options by giving written notice to Landlord not less than one hundred eighty (180) days prior to the expiration of the then-current term. The first renewal term shall commence on the date following the expiration of the original term, and subsequent renewal terms shall commence on the day following the expiration of the previous renewal term. All terms and conditions of this Lease shall remain the same during the renewal term(s), except that Rent to be paid hereunder shall be as provided for in Section 4.2 hereof. The parties acknowledge that time is strictly of the essence in this Lease, such that if Tenant does not timely give notice of such renewal, Tenant's rights to renew as set forth in this section will immediately terminate and be of no further force or effect. (a) First Renewal Term. On the first day of the first renewal term (if any), monthly Rent payable hereunder shall be increased from that payable for the first five (5) years of the original lease term in accordance with Section 3.1 by the lesser of (i) twenty-five percent (25%), or (ii) the same percentage as the increase, if any, in the CPI during the last five (5) years of the original lease term, determined by comparing the CPI most recently published as of the fifth anniversary of the Commencement Date, and that most recently published at the end of the original lease term. In no event shall Rent increase by more than five percent (5%) during any single year within the applicable term or twenty-five percent (25%) during the entire said term. (b) Subsequent Renewal Terms. On the first day of subsequent renewal terms (if any), monthly Rent payable hereunder shall be increased from that payable in the immediately preceding renewal term by the lesser of (i) twenty-five percent (25%), or (ii) the same percentage as the increase, if any, in the CPI during the immediately preceding renewal term, determined by comparing the CPI most recently published at the commencement date of the immediately preceding renewal term and that published at the end of said preceding renewal term. In no event shall Rent increase by more than five percent (5%) during any single year within the applicable renewal term or twenty-five percent (25%) during the entire said renewal term. 5.1 Permitted Use. Tenant may use the Premises for the operation of automobile dealerships, servicing facilities, and related uses, and for no other purpose without Landlord's prior written consent, which consent may be withheld in Landlord's sole and absolute discretion. 5.2 Operations. Tenant shall comply with all Applicable Laws affecting the use of the Premises. Tenant shall not commit or allow to be committed any waste upon the Premises, or any public or private nuisance or other act or thing which disturbs the quiet enjoyment of any other tenants. Tenant shall, within five (5) days after receipt of Landlord's written request, provide Landlord with copies of all documents and information, including but not limited to permits, registrations, manifests, applications, reports and certificates, evidencing Tenant's compliance with any Applicable Laws specified by Landlord, and shall immediately upon receipt, notify Landlord in writing (with copies of any documents involved) of any threatened or actual claim, notice, citation, warning, complaint or report pertaining to or involving failure by Tenant or the Premises to comply with any Applicable Laws. 5.3 Landlord's Inspection. Landlord, prospective purchasers, prospective lenders, and the holders of any mortgages, deeds of trust, option agreements, or ground leases, or another prior right on the Premises, and their agents, employees, contractors and designated representatives, shall have the right to enter the Premises at any time in the case of an emergency, and otherwise at reasonable times following reasonable notice to Tenant, for any reasonable purpose of Landlord or such parties, including, without limitation, to examine the Premises, to exhibit the Premises to others, or for the purpose of performing any obligation of Landlord under this Lease or exercising any right or remedy reserved to Landlord in this Lease. Landlord shall exercise its rights under this section at such times and in such a manner as to minimize interference with Tenant and its operations on the Premises. If Tenant shall not be personally present to open and permit an entry into the Premises at any time when such entry by Landlord is necessary or permitted hereunder, Landlord may enter by means of a master key without liability to Tenant and without affecting this Lease. Such entry shall not be construed as a manifestation by Landlord of an intent to terminate this Lease. Tenant shall not, without the prior consent of Landlord, change the locks or install additional locks on any entry door or doors to the building. 6.1 Tenant's Compliance. Tenant shall not, other than in full compliance with all Applicable Laws and as is necessary for the conduct of Tenant's business in the ordinary course, engage in any activity in or about the Premises involving (i) the installation or use of any above or below ground storage tank, or (ii) the generation, possession, use, storage, transportation or disposal of Hazardous Substances. Tenant shall, at Tenant's sole cost and expense, fully, diligently and in a timely manner, comply with all "Applicable Requirements," which term is used in this Lease to mean all laws, rules, regulations, ordinances, directives, covenants, easements and restrictions of record, permits, the requirements of any applicable fire insurance underwriter or rating bureau, and the recommendations of Landlord's engineers and/or consultants, relating in any manner to the Premises (including but not limited to matters pertaining to (i) industrial hygiene, (ii) environmental conditions on, in, under or about the Premises, including soil and groundwater conditions, and (iii) the use, generation, manufacture, production, installation, maintenance, removal, transportation, storage, spill, or release of any Hazardous Substances), now in effect or which may hereafter come into effect. Tenant shall, within five (5) days after receipt of Landlord's written request, provide Landlord with copies of all documents and information, including but not limited to permits, registrations, manifests, applications, reports and certificates, evidencing Tenant's compliance with any Applicable Requirements specified by Landlord, and shall immediately upon receipt, notify Landlord in writing (with copies of any documents involved) of any threatened or actual claim, notice, citation, warning, complaint or report pertaining to or involving failure by Tenant or the Premises to comply with any Applicable Requirements. 6.2 Indemnification. Tenant hereby agrees, at its sole cost and expense, to be directly responsible for and to indemnify, protect, defend and hold Landlord, its directors, officers, employees, and agents, option, harmless from and against any and all losses, damages (whether direct or consequential), liabilities, judgments, costs, claims, liens, expenses, fines, injunctions, suits, proceedings, disbursements, penalties, loss of permits, attorneys', experts' and consultants' fees and disbursements, and court costs arising out of or involving any Hazardous Substance brought onto the Premises by or for Tenant, its agents, contractors, subcontractors, independent contractors, employees, invitees, licensees, or by anyone under Tenant's control, in violation of this section or as a result of a breach of Tenant's covenant set forth in Section 6.1 above. Tenant's obligations under this Section 6.2 shall include, but not be limited to, the effects of any contamination or injury to person, property or the environment created or suffered by Tenant, and the cost of investigation (including consultants' and attorneys' fees and testing), removal, remediation, restoration and/or abatement thereof, or of any contamination therein involved, and shall survive the expiration or earlier termination of this Lease. No termination, cancellation or release agreement entered into by Landlord and Tenant shall release Tenant from its obligations under this Lease with respect to Hazardous Substances, unless specifically so agreed by Landlord in writing at the time of such agreement.